An outrageously cool guitar with an inspiring set of tones available. This guitar has songs in it! Imbued with a Gretsch voice, but has it's own personality. Super HiLo'Tron pickups. Nice neck. Decent value. Last September, we were wowed by the way in which the likes of theG6139T-CBDC Falcon and G6137TCB Panther combined all of the sonic and visual sauce of classic Gretsch hollowbodies with the stage-ready sturdiness demanded in modern, loud rock scenarios. However, we had to admit that street prices of around £2,500 or more put them beyond the reach of many everyday, gigging musicians. Fortunately, in the G5622T-CB, we have a new Electromatic centre-block model available to mere mortals. 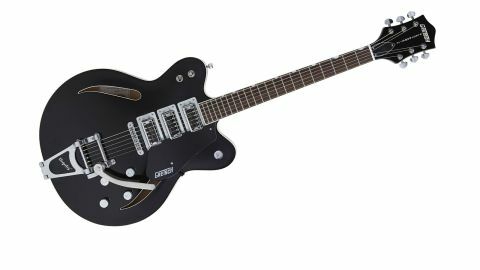 The Electromatic moniker has existed in the Gretsch product line for decades, but the name was revived in the 1990s to grace its Korean-made budget guitar line. Under Fender's custodianship, the Electromatic Collection has gradually been refined, and the number of units shifted reflects this; it's claimed in some quarters that the now-discontinued G5120 is the best-selling Gretsch guitar of all time. Straight out of the box, the three-pickup G5622T-CB provokes the kind of reaction in the Guitarist office usually reserved for a dreamy Custom Shop creation. This is indicative of how much closer to the 'real thing' Gretsch's Electromatics have come these days in terms of fit, finish and overall vibe. "This instrument looks and feels like a grown-up member of the family, rather than a cobbled-together budget afterthought"
Thumbnail fingerboard inlays, more classic-looking pickups and surrounds, chrome arrow knobs and strap buttons, along with three sharp finish options all contribute to making this instrument look and feel like a grown-up member of the family, rather than a cobbled-together budget afterthought that is Gretsch in name alone. "Our guitars will always have a look and vibe that pays tribute to our past. In the case of the cat's eye soundholes, we originally used them on the Synchromatic archtop guitars in the 1930s." New Gretsch Super HiLo'Tron pickups feature across the Electromatic Center-Block range, here in all three positions. "The Super Hilo'Trons are based on our original Hilo'Tron pickup," says Adam. "As the name suggests, they're designed to have an emphasis on the high and low frequencies - a clear top end, with a punchy bass, and kind of a scooped mid. The originals were lower-output single coils, while these are humbucking, so more power, and no 60-cycle hum." That extra middle pickup can be switched in and out with the two-way toggle situated next to the three-way pickup selector switch on the upper horn. With the middle pickup disengaged, you get standard bridge/twin-pickup mix/neck options. Flipping the two-way switch gives you bridge and middle, all three, or neck and middle. In addition, the G5622's tone control only affects the bridge and middle pickups. It takes a little getting used to for players used to classic Fender and Gibson switching, but the arrangement becomes more intuitive with playing time. Comparing this guitar directly to a more traditionally constructed Gretsch instrument, there's a marked difference in strapped-on feel as the Electromatic neck is set at a shallower angle. Where the fingerboard would end in a raised lip and a steep neck angle would create a fairly high string position across the guitar's top, requiring the use of a bridge base in order to gain sufficient string clearance (much a like an old-time archtop), the neck here meets the body in a more Gibson-like fashion. It's less authentically 'Gretsch', but also less alien for players making the jump from a more mainstream electric solid or semi. "These dual-coil pickups feel both classic and current at the same time, and utterly moreish"
While the 21-fret G5622 benefits from double-cutaway construction, it's not always easy to execute high-register lead work. That said, the maple neck has a 'Modern Gretsch' profile that sits somewhere between a medium C and D shape, and is sufficiently comfortable that you instantly forget about it and focus on playing. Using a Japanese-made G6137T-CB Panther loaded with modern Filter'Trons as a reference, this Electromatic has a voice that unmistakably originates from the Gretsch stable but provides an interesting variation on that theme. The Super HiLo'Tron is an interesting proposition. With bright, lower-output pickups such as the DeArmond Gold Foil all the rage at the moment, the cutting, single coil-like tones on tap from these dual-coil pickups feel both classic and current at the same time, and utterly moreish in combination with spring reverb and Bigsby. The addition of the middle pickup in combination with bridge or neck reveals an almost Strat-like wiriness that brings to mind George Harrison's Tennessean and the twang of those original 60s HiLo'Tron pickups on Beatles For Sale. They handle high gain too, but there's a brashness that predictably works better for fuzzy alt-rock, indie and Jack White and Dan Auerbach-isms than traditional heavy rock. As we recently highlighted (with reviews of the Guild Starfire V with Bigsby, LTD Xtone PC-1V and Fret-King Black Label Elise 'JE'), there's really no shortage of rock 'n' roll semis to choose from right now, but if Gretsch's styling and sonics appeal then a sub-£800 street price makes this guitar a very attractive proposition. If money were no object, we'd of course opt for a Professional Collection instrument or one of Stephen Stern's astonishing Custom Shop creations, but let's face it, back in the real world we'd all jump at the chance to pick up a guitar that's 90 per cent as cool and inspiring for sensible money. The best Electromatic to date? No doubt.